Having already seen the first four hours of the new season of “24,” I can tell you without hesitation that it’s absolutely going to be worth your while to tune in when Jack Bauer’s latest day kicks off on January 17th, but, then, if you’re a fan of the show, you’ve probably already had your Sunday night planned out for quite some time now. 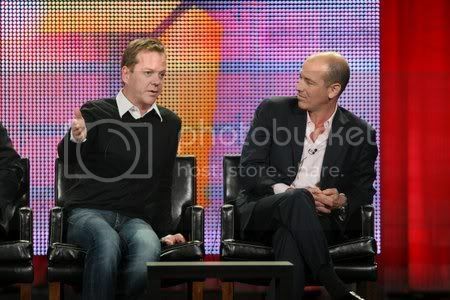 What you’re likely more interested in knowing is if this will be the last season of “24.” Fortunately, that was the first question posed of Kiefer Sutherland and his fellow executive producer, Howard Gordon, during Fox’s panel for the series. 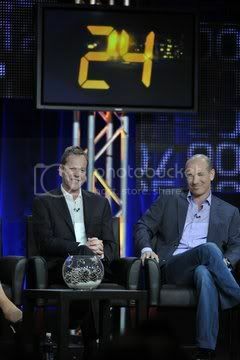 As readers of David Medsker’s weekly blog are already well aware, “24” is back on Fox in a big way, and the show was back at the January TCA Tour in similar fashion, earning its own panel this time around. (The decision in July to relegate the series to a half-hearted “24”-sponsored luncheon, with critics being forced to fight from scrum to scrum in order to get their questions answered, earned my ire in this entry.) From the questions being posed, it was clear that, after a less-than-stellar sixth season, many in the audience have found themselves becoming fans of the show again in Season 7. In particular, it seems that the little moments are what’s doing it for them, such as the scene in the car with Jack and the cop, where Jack acknowledges that maybe they were right in questioning him. Of course, if you’ve been watching this season, then you’ve probably already noticed how many times Jack has been standing up for his actions after being condemned by others. This might…just maybe…be a case of the show’s writers lashing out at their critics.